The new Abby Abernathy is a good girl. She doesn’t drink or swear, and she has the appropriate percentage of cardigans in her wardrobe. Abby believes she has enough distance between her and the darkness of her past, but when she arrives at college with her best friend, her path to a new beginning is quickly challenged by Eastern University’s Walking One-Night Stand.Travis Maddox, lean, cut, and covered in tattoos, is exactly what Abby needs—and wants—to avoid. He spends his nights winning money in a floating fight ring, and his days as the ultimate college campus charmer. Intrigued by Abby’s resistance to his appeal, Travis tricks her into his daily life with a simple bet. If he loses, he must remain abstinent for a month. If Abby loses, she must live in Travis’s apartment for the same amount of time. Either way, Travis has no idea that he has met his match. I can’t say this a wonderful love story or that I loved the characters, yet I couldn’t help but to keep listening until I was finished – I was completely engrossed and totally committed to Travis and Abby’s story, even if it were just a foreboding feeling that drew me to them. Travis is total Badass, complete with tattoos and plenty of bad habits, and to making more attractive, he’s got a temper from hell….. Yup, he likes to destroy things and beat people up when he’s mad, but he would never hit a woman…..Thank God for little things! He’s a total womanizer….. That is until he meets the one girl that won’t fall for his charms; yes OK, he’s cute. Travis falls for Abby, and falls hard, so hard that he becomes uncontrollably possessive, controlling and kind of stalkerish, in other words he really falls in-love….. Or is it obsess? In my opinion, the latter would be more appropriate. On the other hand, we have Abby, apparently a good girl with a good head on her shoulders, but we come to find out she has a past to hide, and one that she’s trying to run away from. As much as Abby knows how bad her relationship with Travis is, she finds herself unable to stay away from him, or to stop herself from antagonizing him, and it reminds me of just how much I found myself unable to stop listening to their story. I think that, for me, it all comes down to the author’s ability to nail you to the pages, and Jamie McGuire is really good at that with this novel. Love then or not, the characters are well developed, I feel like I truly know them, and the fast pace makes it a quick listen. Would I recommend it as a romance? I’m not so sure, It’s hard for me to find a dysfunctional relationship romantic, or finding an insecure 19 year old boy attractive, but one thing I can honestly tell you; I really, really enjoyed the novel. We still get a happy ending, even though in my opinion, the unspoken epilogue screams disaster. I know my review comes across more as a negative take; it all goes to show that even a bad story can be truly enjoyed if it’s well written. 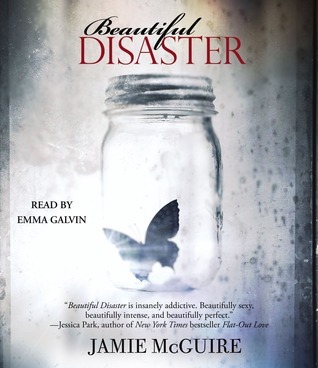 Emma Galvin is impressive with her performance of Beautiful Disaster; she really makes you feel the angst and anxiety in the story. Her portrayal of both, Travis and Abby, was right on target, I really felt that it conveyed their personalities very accurately, and she gave credibility to the characters. I had no problems distinguishing the different voices, and her tone and the pace were excellent. This is my second experience with her work, and as much as I enjoyed her delivery of Divergent, I have to say, I loved her here. I loved this book as well. I’m looking forward to Walking Disaster. I hope she moves forward with the series too, beyond Travis and Abby. Great review chica!! I know, your review was one the ones that helped decide to listen to it, I’m glad I did. That’s awesome!And good to know 🙂 Almost time for Walking Disaster!!!! YAY! Thanks Kimba, Emma Galvin really nailed this one, her performance was a big part of my enjoyment.